Redmond literally rolled out the blue carpet for the 4,000 IT professionals, developers, staff and partners who attended its official launch event for Windows Server 2008, Visual Studio 2008 and SQL Server 2008 today in Los Angeles. While the launch wasn't actually timed with the products' releases -- Visual Studio 2008 was released in November, Windows Server 2008 is being released March 1 and SQL Server 2008 is coming later this year -- Microsoft CEO Steve Ballmer used his keynote at the Nokia Theatre this morning to promote how the products will work together to create a "dynamic IT" infrastructure for enterprises. 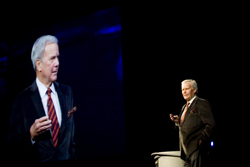 Following a short introductory speech by veteran television journalist Tom Brokaw addressing how technology can make lives better for millions worldwide, Ballmer took the stage and dove right into the company's "Heroes Happen Here" launch theme. Journalist and former NBC News anchor Tom Brokaw opened the keynote with his thoughts on technology's impact around the globe. "To me the heart of this industry are the software developers and IT professionals who go out every day and make great things happen," he commented, "working every day to make their companies better...building new solutions, getting them deployed." "[These products are] simply the enablers for the types of heroes represented here in this room and in the IT and software development community worldwide." For Windows Server 2008 -- which has been released to manufacturing and is scheduled to go live on March 1-- Ballmer focused heavily on its role in the company's overall virtualization strategy. In fact, the server's built-in virtualization solution, Hyper-V, took the No. 1 spot in one of the keynote's slide showing the top 10 innovations in the product. "Today we launch our virtualization strategy in earnest," he said. "We want to democratize virtualization," making it easy, efficient, interoperable and cheap enough to run on as many servers as a company desires, he said. "The thing that is quite unique about our approach to virtualization is that we take virtualization as just a piece of overall management," he continued. "You don't manage [virtualization], you manage a datacenter." Hyper-V will come in beta form with Windows Server 2008; a final version is expected to debut during the third quarter. Ballmer also spoke about what Microsoft feels Visual Studio 2008 is bringing to the development community. "We live in a world where the need for speed [in] developing new solutions, new applications...has never been higher," he commented. "Visual Studio 2008 brings technologies for building new, rich Web applications very rapidly.....the ability and speed at which someone can write an application has never been stronger." 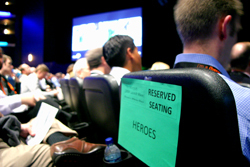 Microsoft's IT heroes sat front and center at the launch event. He also promoted the strength of IIS 7, of which he said is "the best platform, bar none, for hosting Web applications either in a shared or nonshared environment." And he emphasized the future of open development -- "not just open source," he commented, "[but] openness for interoperability [and] opening the development process so that designers and codes are linked from the beginning." With SQL Server 2008, the keynote focused on upcoming version's new resource management tools as well as its business intelligence reporting tools that can be used in conjunction with a range of Microsoft products from Excel to SharePoint to Microsoft Maps to build interactive, real-time interfaces. "We've done lot of work to optimize [it] for data integration, reporting and analysis...with all different class data types," he said. Other features highlighted in the presentation include policy-based management, on-the-fly "transparent" database encryption and geospatial data support. Following the keynote, breakout sessions offering more details on all of the products were held at the Los Angeles Convention Center next door, with a large party planned for this evening. Microsoft's Heroes Happen Here launch strategy continues with a series of free events being held worldwide over the next few months.